EXPERIENCE THE ADVENTURE of riding the world's largest rotating tramcars. 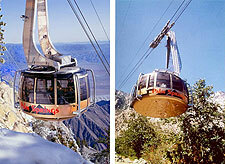 Traveling up over two and one half miles in just 10 minutes the Palm Springs Aerial Tramway takes you to the Mountain Station located in the pristine wilderness of the Mt. San Jacinto State Park. Tram cars revolved slowly from within, offering spectacular views. The Mountain Station has two restaurants, gift shop, natural history museum, viewpoints and more. Your group adventure starts here.